Nowadays, I believe for most of you guys, from “hardware” like the dress and shirts you wear to software like mobile apps you use, there are more and more requirements for personalization and customization. Then as your gate to the Internet, of course, MX5 settings could also be customized. 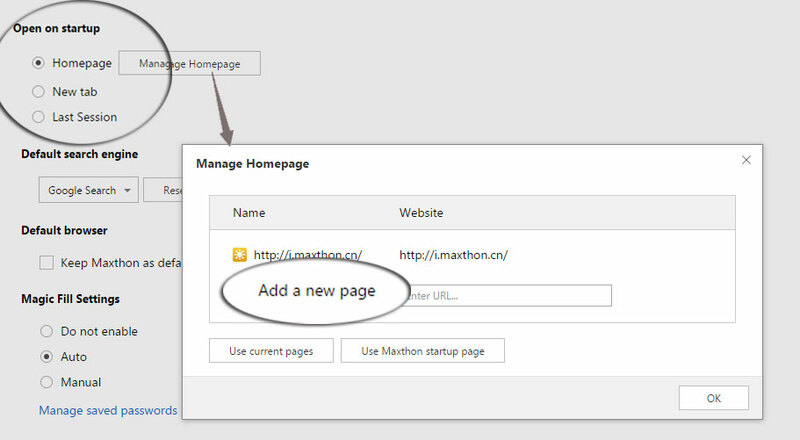 Today we will give a detailed introduction to Maxthon settings. Please feel free to use Ctrl+F when you need to search for certain content. Start your browsing with a certain website as your homepage. Check “Homepage” and click “Manage Homepage”, you will be able to edit the page’s URL as your homepage. After entering the URL, click “OK” and the homepage setting will be saved. Start your browsing with the Quick Access/Quick Dial sites. To achieve that, check “New tab” and next time QA page will be your homepage. Start your browsing with the last session. It will show all pages that you didn’t close when you exit or close the browser last time. Default search engine tells which search engine you will use when you search directly on Quick Access page or address bar. By clicking the triangle icon, you can choose your preferred search engine from the built-in options, for which the URL and sorting order could be edited from Search Engines Management. You can even add some more items from our recommended search engines. Magic Fill Settings are more related with Passkeeper. Do you still remember that in our previous blog about Passkeeper, there’s an “Autosaved Passwords” session? It keeps all passwords autosaved by the browser, and in Magic Fill Settings, if you check “Auto” option, these passwords and accounts information will be filled automatically to the right website, thus making full use of the Passkeeper feature of MX5. Warn on exit could be checked if you need the browser to ask you for confirmation. This is usually used when you have multiple tabs are open and the browser needs to check whether you want to close all tabs or only the foreground one. If you don’t want to receive this warn anymore, you can disable it from this session, or check “Do not ask again” directly when it pops up. System tray icon is the small icon shown in the end of your system taskbar. Do you want MX5’s icon to be shown in system task bar? If yes, then check “Always show icon in system tray”. If you want to hide your MX5 to system tray icon, then check “Minimize to system tray” or “close to system tray” when you want to close it directly. New tab position gives you options where you want the new tab to be placed when you already have some tabs on the run. 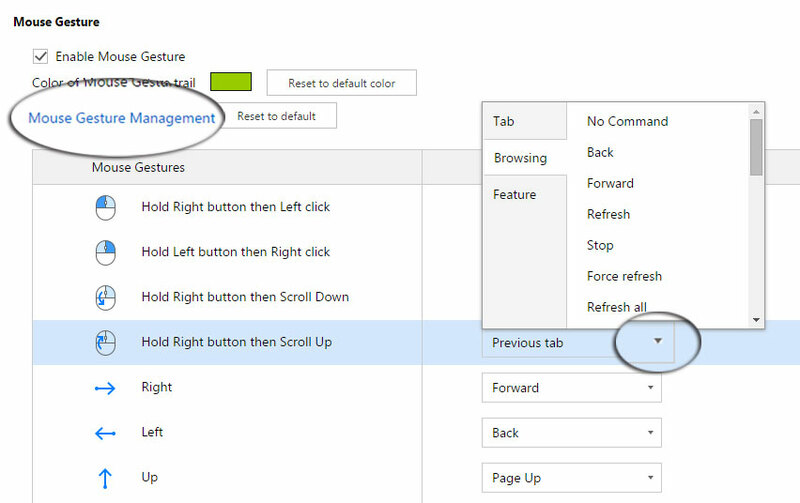 You can choose to put the new tab to the right of the current page, or to the right of all open tabs. New tab action tells on which occasion a new tab will be brought up instead of changing directly on the current page. For example, if you check “Open a new tab from the address bar”, then next time when you type in a URL in address bar and click “Enter”, the target URL will be opened in a new tab. But if you uncheck it, the target URL will be opened directly in the current page. Close tab gives you clues about some shortcuts for closing tab, and which page you will be switched to after closing current tab. Appearance here refers to the appearance of tabs and browser buttons. 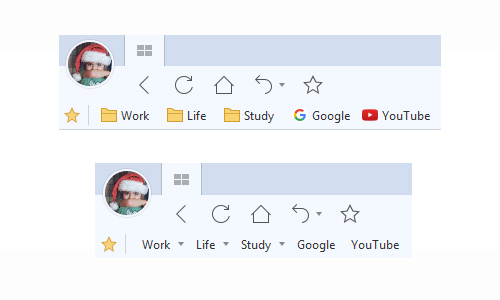 If you want the close button of background tabs to be shown, then check “Show Close Tab button on background tabs”; If you don’t want the browser to show Maximize, Minimize and Close button, then uncheck “Always show maximize, minimize and close button”. Browser language is where you can set your browser’s language. Please notice that to make the installation file smaller, only your system language and English language are included in installation file and could be switched directly. For more others, you may need two steps to customize the language of your browser. Firstly, click “Add language” and choose your required language in the next box. Don’t remember to click “OK” to save it and then this new language will be downloaded. Secondly, after that you will see this language from the first primary menu. Select it from the triangle icon, and your browser will be switched to that language. Download Settings allows you to set the default downloaders in Maxthon5 (if you have external downloaders installed in your system). 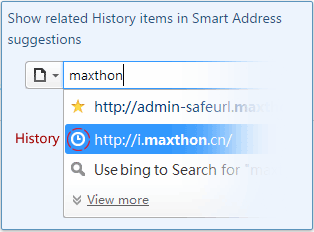 In many “old” Maxers’ eyes, Maxthon browser is famous for its shortcuts and mouse gestures. We keep and improve some great and handy gestures in Maxthon5 browser. As above, you can also customize it by yourself. Quick save images is a shortcut that allows you to save images directly by clicking while holding the CTRL key. You can also customize the default save location for these downloaded images here. Drag and Drop is a handy and convenient shortcut. After it is enabled, you can open links directly in a new tab when you drop and drag with your mouse. Mouse Gesture is the session where you can customize all your mouse gestures in “Mouse Gesture Management”, including the color of mouse gesture trail and the definition of each gesture. Your mouse gestures could be totally customized according to your own usage. 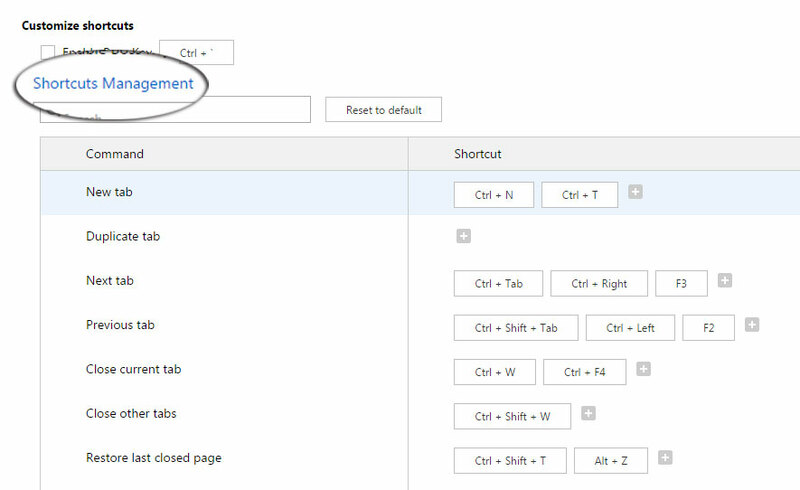 Customize shortcuts Similar with mouse gesture above, in this session you can personalize all shortcuts by adding, deleting or editing, to make MX5 your own browser. Smart Address Bar is called “Smart” because after it is checked, some history URLs will be shown in suggestions when you are typing in the address bar. Navigation is mainly about some shortcuts to certain URLs. 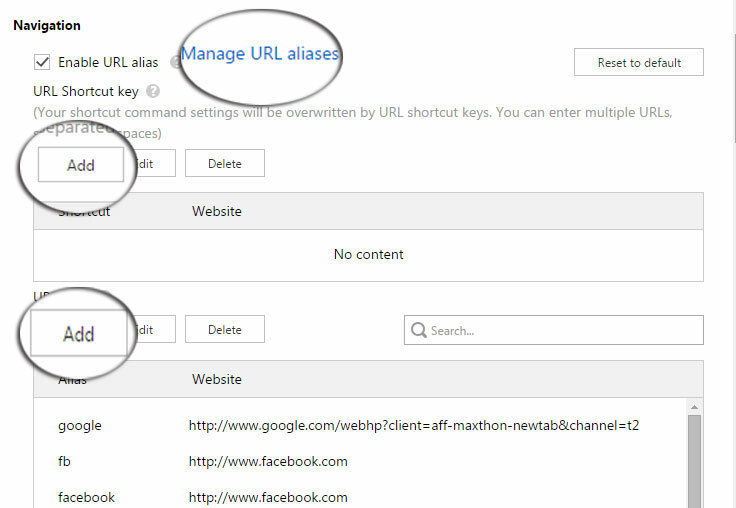 If you have some websites that are used frequently, you can go directly to this URL by URL Shortcut key or URL Alias. For the former, URL Shortcut key, you can set some favorite sites to your F1-F12 keys, and next time when you click these function keys, you will go directly to the corresponding URL without typing in complete URL in address bar. For the latter, URL Alias, it is similar with above, but not limited to only F1-F12. You can “name” a URL with a short name, and next time when you type in this “name” (instead of full URL), you will go directly. Address Bar is an option that allows your browser to display full URL instead of only the main domain in the address bar. After checking this box, you will have classical address bar with full URL shown. Page Zoom lets you set the zoom value of your page. It could be selected from suggested value, or you can type in the exact value you want. Web page display is about all pages’ display in this browser. Here you can adjust the web page font and decide whether to enable DirectWrite rendering. Browsing allows you to make some default settings in Ultra Mode and Retro Mode. If you don’t want the browser to choose an adaptive mode for different websites, you can check “Always use Ultra Mode” to disable Retro Mode for all websites. Vidoe float bar controls the pop-up box on the right corner of a video, which shows “Download” & “Pop-up”. If this item is unchecked, this pop-up box will not be shown for videos. So if you couldn’t get the pop-up notification for videos, you can come here and check whether this option is checked. 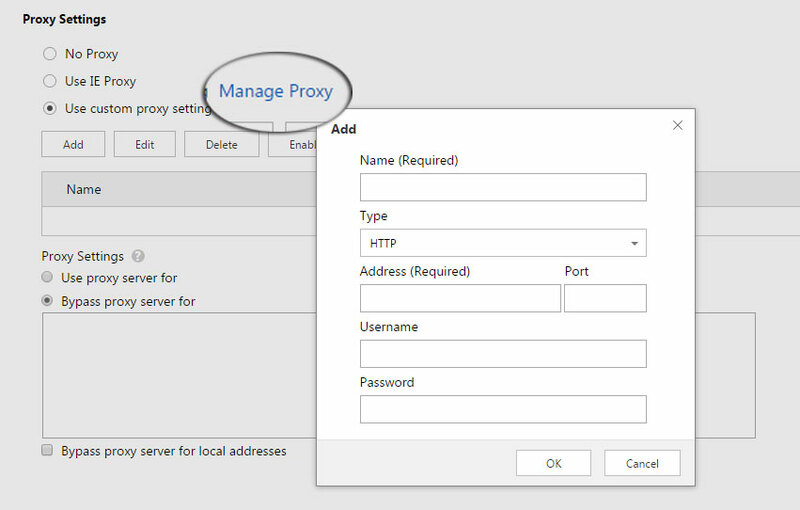 Proxy Settings helps you decide whether you need to use a proxy in Maxthon 5 browser, and you can also custom your own proxy by clicking “Manage Proxy”. Spell Check is a handy function in Maxthon browser. Once enabled, when you are typing in Maxthon browser, the edit box will give some error notification when a wrong spelling is detected. Certificate Management gives you a list of all website certificates installed in your Maxthon browser, including personal certificates, certification authorities, and also untrusted publishers. Though put in “Others”, the three contents here are all important. The first one is cache location. You can customize the cache location in your computer by clicking “Browse” button here. The second one is about our User Experience Improvement Program (UEIP). 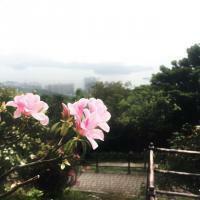 You can join this program by checking before this item, but this program is unchecked by default. If you want to know more about UEIP, click “More” to expand detailed introduction. Customize UserAgent string is a function that allows you to change different UserAgent. Even though you are using Maxthon browser, you can still present your browser to websites as IE, Firefox, Chrome…as long as you have the right UserAgent strings. Sometimes when you couldn’t open certain websites, but there’s no problem in other browsers, you can try changing UserAgent here. User Agent setting is an advanced function, so we recommend that you read more about the UserAgent setting before attempting to change it. You can learn more about UserAgent by clicking “More” or find it here. Well, above is a primary guideline about Maxthon settings. 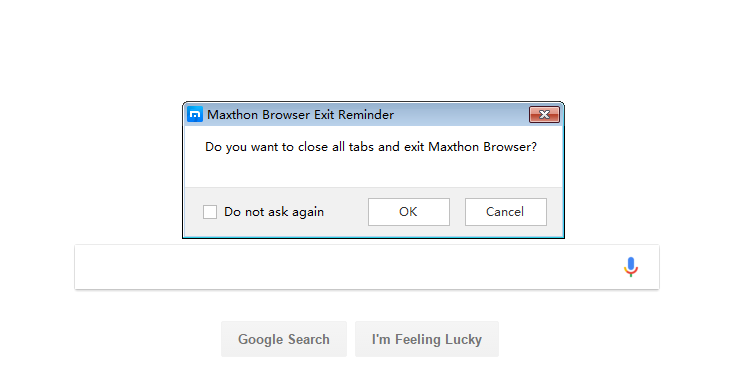 Hope it could help you customize your Maxthon5 browser. For any question, please feel free to contact us at any time!